Often it is forgotten how old civilizations reigned and reached what today are just dreams. Townsfolk today don’t have the slightest idea where they are walking on. The land they plow for harvest, the valleys where they build cities and castles, all these places were once home to long forgotten peoples. Old civilizations that got to the pinnacle of advancement. Ancient elven kingdoms, dwarven dynasties, hobgoblin nomadic armies and even worse, the old giant and draconic kingdoms. There may be even older and stranger things in the eons past. Of all these forgotten cultures, next to nothing is left. Old defaced ruins, closed temples where no one has entered before, and buried settlements that will be left undiscovered until the end of time. 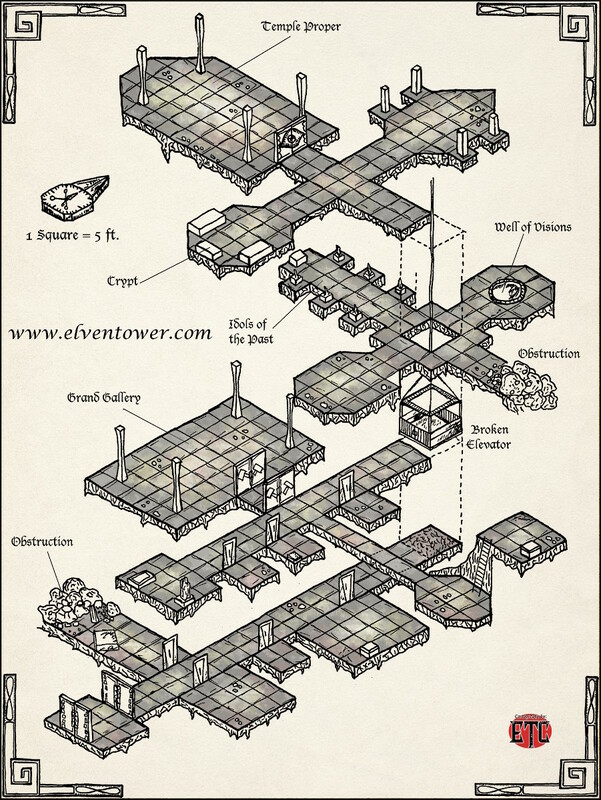 This is what’s left of an old dwarven ruin. Floors and walls are built from blocks of stone, the craftsmanship is unpaired when compared to modern standards. However, most of the decorations on the walls and pillars have faded with time. It is almost impossible to discern the original meanings of them, and thus, the original purpose of this place. In reality it was a barracks with temple area, dedicated to the dwarven god of war, whose name and importance are also lost. Recently discovered by miners or scholars, local barons ordered the exploration of this place, in search of information about the past and treasures. However, two expeditions have been lost. Whoever is in charge of the task will feel inclined to hire expendable mercenaries to clean the place. The ruin has 4 levels, all of them connected through a main shaft where there is an elevator. This elevator is broken and stuck a little after the second level, a character with tools and skill can find a way to make it work. If that is not possible, then the party would have to traverse the different levels with climbing equipment. This underground complex has many options for monster denizens. The dwarves of old could have left clockwork guardians to defend the temple. There could also be dwarf undead, be it skeletons, zombies and shadows for low level parties, or ghosts, wraiths and ghouls for higher level parties. Apart from that, the complex has been accessed twice by marauding monsters. The places in the map marked as obstructions, show places where walls caved in. Any time of underground or underdark monster might have found its way into this place.